Well it’s nearly the end of August, in fact there are only 12 days til spring and I haven’t managed to blog my experience for Plastic Free July. You may wonder whether this was because I was unsuccessful, as I agree it was harder than I expected… and I had mixed results. Anyway for those who do not know what Plastic Free July was, or that I had pleaded to do it. Plastic Free July was an initiative of the Western Metropolitan Regional Council (WMRC) in Perth, Western Australia, developed by Earth Carers staff in 2011. This simple idea aims to raise awareness of the amount of plastic in our lives. Now I would say I’m not one to preach, but then anyone reading this blog knows that would not be true! Part of our lifestyle choice here is to live sustainably, not just in the produce respect. And those who know me, understand this is something I have been passionate about since a young child and even impacted on my educational direction. Though I am the first to admit in our modern lifestyles we quite often make compromises, intentional or otherwise. And part of this lifestyle choice is challenging those choices or habits. So Plastic free July, sounds simple- Attempt not to consume single use plastics for 31 days… Well I figures a commitment to all plastic sounded daunting, so committed to the ‘TOP 4 challenge’ not to consume straws, plastic bags, plastic bottles and coffee cup lids. So straws and coffee cup lids were not such a big deal. In general I use a travel mug for coffee and it as just a matter of being vigilant when socialising to ensure we were not provide a straw with drinks. Plastic bags and plastic bottles was a little more problematic! Firstly I admit I was prepared when it came to toiletries; toothpaste, shampoo, hand/body wash etc. I had previously bought in bulk or have refillable dispensers. 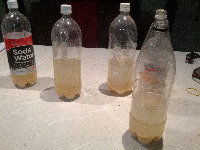 So whilst we didn’t purchase new bottles, we were still consuming those we had prior. This really is cheating but in buying in bulk we would reduce the amount of waste. There those who use alternatives to these, utilising baking soda, essential oils and other kitchen basics. I did attempt to go ‘poo-free’, that is give up shampoo and use these alternatives to reduce my reliance, but I admit I caved! But furthermore, in using these alternatives I found it difficult to buy them without purchasing plastic! Even the glass bottles of the essential oils and cider vinegar we use have plastic lids. Another bottle issue was milk… I know in some countries and places you can still purchase milk, well even have it delivered from your local dairy in reused glass bottles. Here this was not an option. I did investigate UHT milk in tetra pack cartons, but most of these still had plastic caps. And those that didn’t I felt compromised about our preference to buy local and support regional farmers. So milk bottles are still an occurrence in our house hold, though we have always bought bigger (so less waste) and reuse the bottles for other purposes, such as chicken waterers or watering cans for the garden. So over the course of July we accumulated and repurposed 4 x 3l bottles. 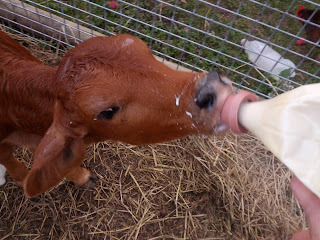 We also reused a few plastic pop (fizzy drink/ soda) bottles that we had in storage (for homemade ginger beer) to feed our calves. So 2 of these made it to the recycling throughout July, as the calves absolutely destroyed them! Which os funny as we generally don't buy drinks in plastic containers, as most of our squash/cordial can be bought in glass bottles and pop/fizzy/soda in cans... though this in itself could be considered over packaging. But the use of the bottles for the calves was better than buying an entire plastic product for the job. Our main ‘failure’ was plastic bags. Now when we were shopping we used reusable bags or elected not to take a plastic bag for smaller quantities. With the one exception of an impromptu grocery shop. So the lesson was learned, carry a small number of foldable bags in my hand bag at all times! Another grocery shopping dilemma was meat. Now we rear a lot of our own meat, but as we are still expanding our operations we still purchase some items such as bacon. So we have a choice purchase form the deli or butcher from unknown sources (or with limited information) that refuse to wrap the items in only paper due to “health & safety” requirements. Or purchase pre-packaged meat identified as “free ranged”… Though even when we produce our own meat, we generally use plastic bags to wrap up the individual cuts for storage, so in this instance our own produce and practices are no better. Our main bag failure however was animal feed. Though all the products we buy are recyclable or made from recycled materials it is still a consumption we are yet to eliminate. We have approached the suppliers about being able to purchase larger quantities, therefore drastically reducing the packaging. But this is one product we are struggling to eradicate. So we ‘failed’. We I would tend to agree however I’m not sure that was the purpose of this challenge. It was always going to be a ‘challenge’, so what were the successes? Well we successfully reduced the quantity of plastic in our general rubbish, as well as that in our recycling. This challenge forced us to consider our options, and whether this was the only option, generally there are alternatives, or at least one that isn’t as bad. I now regularly carry reusable shopping bags… yes I am turning into my grandparents; I remember they always brought their own ‘strong’ shopping bags in their trolley, when they went to town to do their shopping. But I guess that’s the lesson with this and pretty much our smallholding too. We are trying to do what my grandparent’s generation did as a matter of course. So what about you? What throw-away items in your life could you live without?